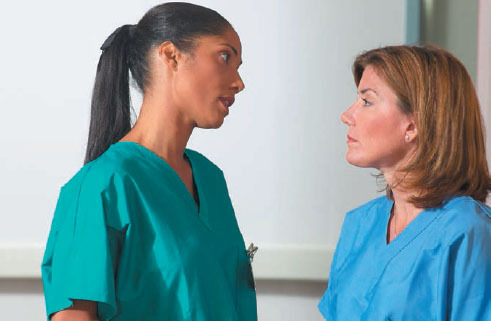 Dealing with difficult colleagues is part of working life, and nursing is no exception. Day-to-day challenges can lead to emotive situations. Conflict at work can be caused by power struggles, says Christopher Lewis, who runs an occupational psychology consultancy. 'Most problems stem from the need to have power and influence over others. What makes people different from each other is how they do this. They may shout and scream or may be timid, but this can still be a strategy to get others to do what they want,' he says. Common situations include making disrespectful comments in front of patients or colleagues, and verbal aggression. Colleagues might also appear to be excluding individuals by not keeping them informed, or by behaving unfairly, says Andrew Moore of South Tees Hospitals NHS Foundation Trust. It is not always possible to walk away from a difficult colleague at work. Difficult colleagues can make others feel devalued and dissatisfied, says Professor Lewis. ‘If you have a difficult friend you can walk away; but you cannot walk away from work,’ he adds. It can be tempting to ignore difficult behaviour, but this can lead to resentment, so take action. Ask why a colleague is being difficult and who they are trying to influence, and reflect on your own behaviour. You will need to plan that difficult conversation, and make sure you hold it privately. Be clear about what makes you uncomfortable about the behaviour, and try to consider the issues calmly. When having a private discussion, express your views clearly. Confrontation can escalate the situation. Emotions can run high, so be as calm as possible. Acknowledge that the conversation might be difficult. If an individual makes a strong defence, ask them to tell you more. ‘Dig deeper about what they feel and what they mean – don’t interrupt, and listen,’ advises Professor Lewis. Dealing with difficult colleagues is a normal part of working life. Reflect on why a colleague might be difficult, on your own behaviour, and your influence. Plan that difficult conversation, and ensure it is held in a private place. Use such phrases as ‘I acknowledge this discussion might be difficult’, and invite your colleague to tell you more. If a colleague’s practice may be detrimental to patient care, contact your manager and/or HR. A gentle conversation can often help individuals recognise when their behaviour has been inappropriate. ‘When you hold up a mirror to a colleague and say: “This is how you make me feel sometimes,” people often say they are sorry and admit not realising,’ says Mr Moore. Sometimes it is not possible to have a one-to-one conversation with a challenging colleague, if, say, their practice is detrimental to patient care. In these situations, nurses should talk to their manager and/or human resources officer. Dealing with difficult colleagues can be tough, but it is an opportunity to acknowledge different ways of working. Do not feel afraid of difficult conversations. Nurses can pre-empt further problems in a team, and help ensure they do not harm patient care.